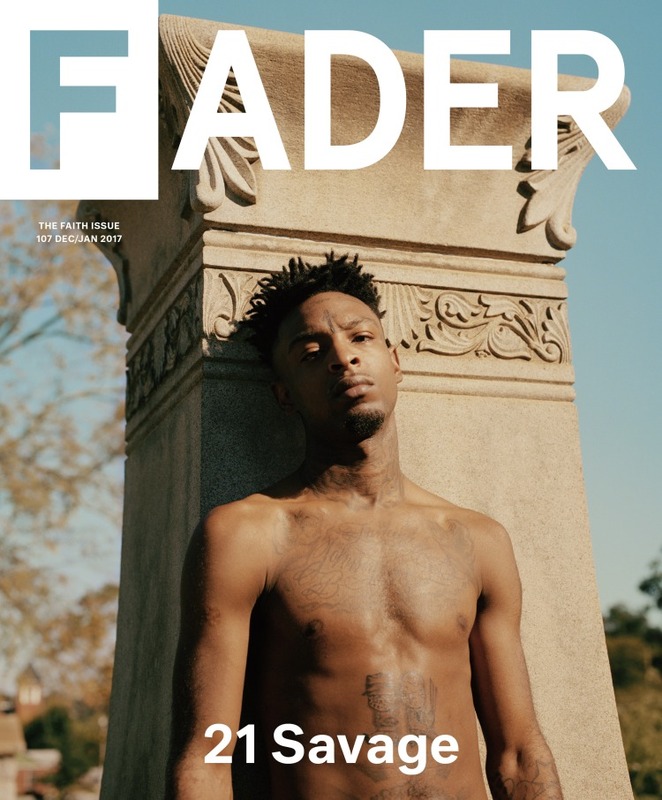 After teaming up with Drake on his new song "Sneakin'" 21 Savage graces the cover of FADER Magazine. The cover story goes behind the scenes with Savage in Atlanta, delving into his childhood and telling the story behind his rise into mainstream music circles over the past year. "Walking out of the vocal booth, he hops onto the table, gently sliding a Glock away to make room. Everyone else is getting high and eating cookies. He picks up the gun, cradles it in both hands, starts planting little kisses all over its barrel. “Love you, baby.” The way Savage remembers it, he was 8 when he first saw a gun. A .38 revolver. His uncle Dae Dae showed it to him, told him what it was, taught him about its uses and its dangers. At that point, he’d been getting cap guns for his birthday for years, and had long since fallen in love with firearms. “Ran around the house shooting the hell out of my brothers,” he recalls happily. “Pow. Pow. Pow!”" You can read the full interview here. After teaming up with Drake on his new song "Sneakin'" 21 Savage graces the cover of FADER Magazine. The cover story goes behind the scenes with Savage in Atlanta, delving into his childhood and telling the story behind his rise into mainstream music circles over the past year. "Walking out of the vocal booth, he hops onto the table, gently sliding a Glock away to make room. Everyone else is getting high and eating cookies. He picks up the gun, cradles it in both hands, starts planting little kisses all over its barrel. “Love you, baby.” The way Savage remembers it, he was 8 when he first saw a gun. A .38 revolver. His uncle Dae Dae showed it to him, told him what it was, taught him about its uses and its dangers. At that point, he’d been getting cap guns for his birthday for years, and had long since fallen in love with firearms. “Ran around the house shooting the hell out of my brothers,” he recalls happily. “Pow. Pow. Pow!”"